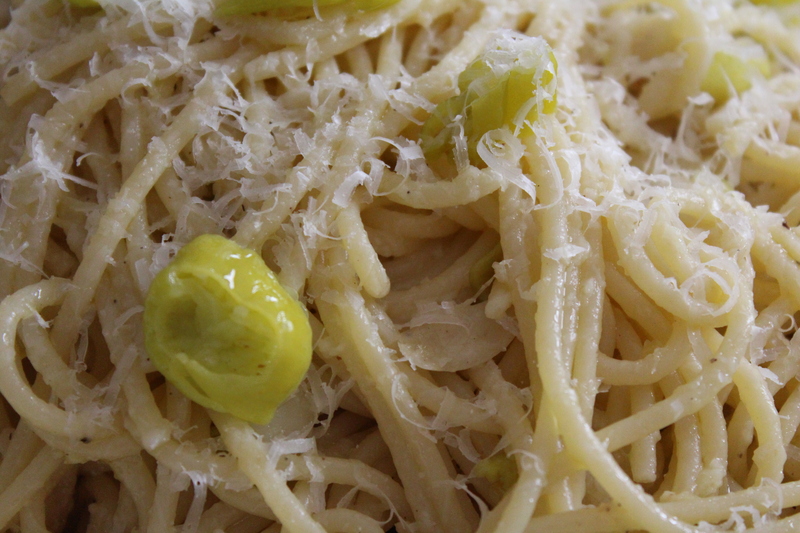 If I were given the opportunity to pick my last meal on earth, I would choose, without hesitation, spaghetti ala olio. Or as we’ve called it since childhood, spaghetti ollie oley. Though some dishes have more significant memories attached or elegant ingredients, none make my taste buds happier. That right there is almost the entire original recipe as haiku. 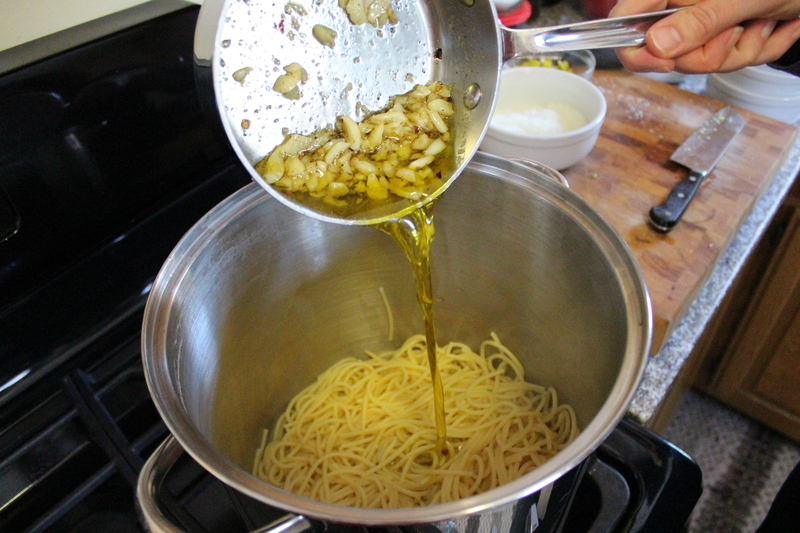 When I was a child, Mom served this traditional spaghetti ala olio with some regularity. Traditional to my family was pasta tossed with warmed olive oil in which slivers of garlic were poached to just this side of caramelized, sprinkled with hefty grinds of black pepper, and a sprinkling … some may call it a snow shower … of parmigiano to finish. Happy dance when you saw Bunny chopping mounds of garlic. Something good was coming to the table. Toss in pickled pepper heat. And that right there is my take on spaghetti ala olio. 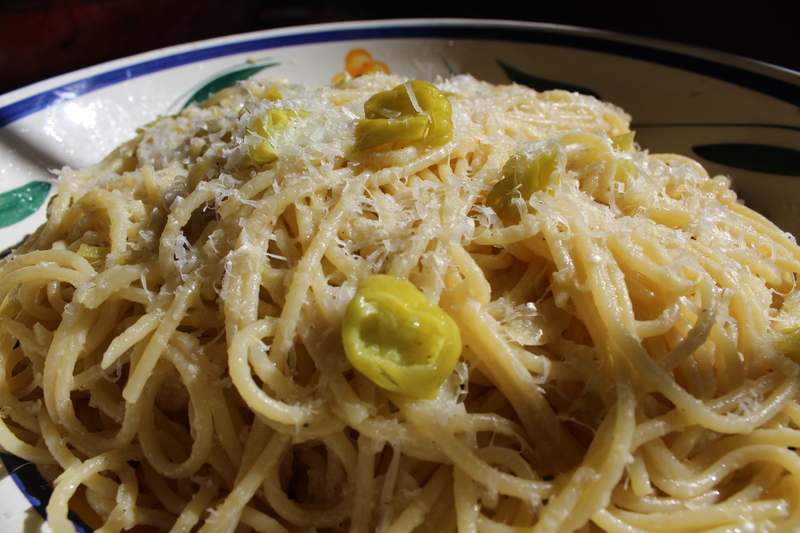 My version is con pepperoncini e peperoncino e grani di pepe (my poor translation: with lots of peppers!). I add pepperoncini, dried red pepper flakes, and ground black pepper to the pasta. 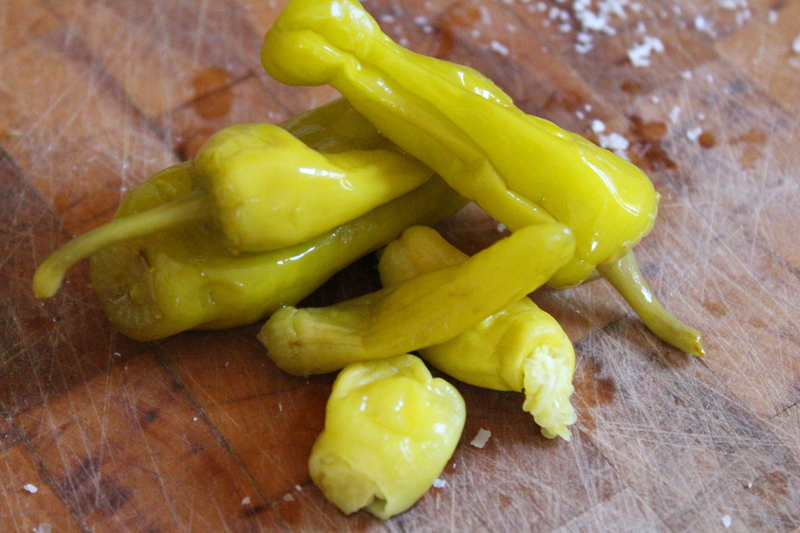 If you’re a tender tongue, you can omit or reduce the pepperoncini and reduce the red pepper flakes. There’s also something to be said for moderation if small children are involved. However, as we’ve learned in my house, they do adapt or drink a lot of milk – neither a bad thing. I truly could probably eat this every day and have found – fortunately or unfortunately, depends on who you ask – a kindred spirit in the house; he of fair hair, freckles and slim build will pick spaghetti ollie oley nine times out of ten if given the choice. My heart is warmed and my tummy overjoyed by that sort of dedication and loyalty. And it’s not so bad the tenth out of ten is generally pizza. We are not on a high-protein diet, n’est-ce pas? With only seven ingredients that you probably have most of in your pantry or fridge at any given time (eight if you count salt for the pasta water), this is a quick and obscenely delicious dish. You get quite a return on your investment … if that’s your sort of thing. That being said, you really need to use the best ingredients you can find because there are no bit players here; each taste is in the foreground of every bite. To start, get a large pot of water on to boil. Salt liberally. I read somewhere that it should taste as salty as the Mediterranean. Sounds good to me. Next, collect all of your ingredients. This should take you thirteen seconds, sixteen if you’ve forgotten where the pepper grinder is. 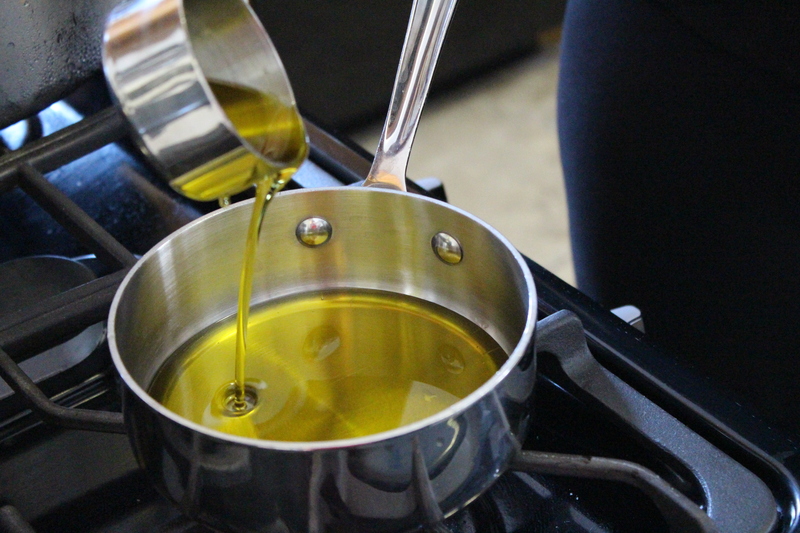 Pour the olive oil into a small saucepan over low heat. It seems like an awful lot of oil. It is not. In fact, you may need to drizzle more on at the end. In a fit of laziness, I have stumbled upon the best trick ever. You don’t need to sliver the garlic! Just tip and tail each clove and remove the paper. And then ploop! Drop them into the warmed oil. Add the red pepper flakes and black pepper to the garlic and let it come up to a simmer, swirling the pan every once in a while, for about 10 minutes. While the garlic is on to simmer, choose some nice plump pepperoncini (this is a decent amount for the average heat-seeker). Remove the stems. Chop the pepperoncini coarsely. This offers tender-tongues the opportunity to bypass the little nuggets of deliciousness. Also, I’ve found that imported Italian brands generally have more heat than the American brands (even those who are sporting Italian-sounding names). If it does not say “imported from Italy,” it isn’t. When the garlic starts to soften (at about ten minutes but do check earlier, depends on the age of the garlic), use a fork to mash the cloves a bit, leave chunks for your diners’ enjoyment. Let it stay over the low heat to get almost golden. If you are concerned about burning it (which would make it taste bitter), it’s okay to turn off the heat now and just let it steep in the pot until you need it. You’ll have plenty of time to grate the cheese as well. 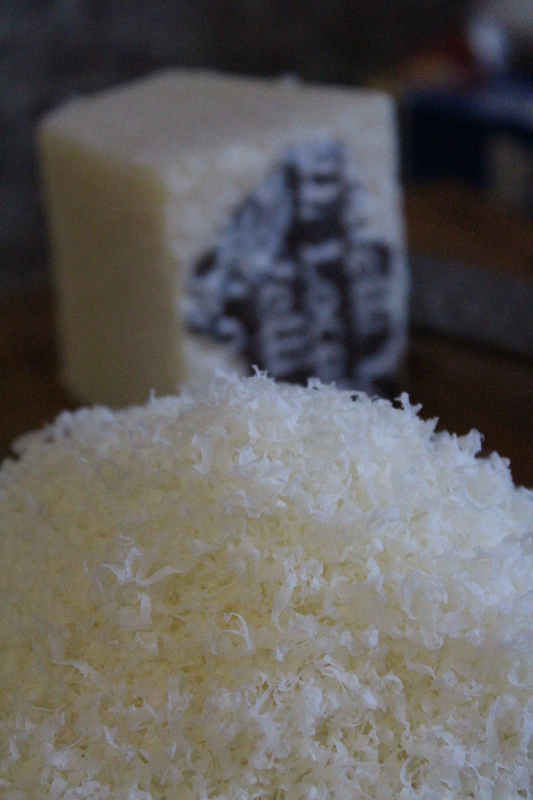 Today, I’m using Pecorino Romano. If I’ve got it , I’ll use Parmigiano Reggiano. Either is tasty delicious. Please don’t use the stuff in the green can. I won’t beat that dead horse … just read the label and you’ll understand. Like a well oiled machine. Just as the ingredients are all prepped, the spaghetti is ready to be drained. It should be al dente, not mooshy. If you use the good stuff, the cooking directions on the box won’t steer you wrong. Put the pasta back into the pot and add the oil, garlic and peppers mixture. Toss to combine. Add the pepperoncini (I also add a bit of the liquid from the peppers if everyone at the table is on board for a tad more spice). Alternatively, you can have an extra bowl of chopped pepperoncini at the table for folks to add to their liking. If, for some reason, the pasta doesn’t lightly glisten with the oil (meaning it looks glumpy which can happen if it cooks too long) just swirl in a few drizzles of olive oil. Alternatively, a cruet of olive oil at the table for individual drizzles could work … I’ve never done it but it’s a thought. Pour into your serving bowl and sprinkle liberally with the grated cheese. Have more at the table to pass around. Trust me, you will want it. And that, is that. Have friends over to share! Or, do what I do … before serving, I put aside a little dish to save for breakfast. Cold. Heaven in a bowl. I tell you this to let you in on my taste profile … in case you had reservations about trying any of this. Enjoy! Put on a large pot of water to boil. Salt the water liberally. While waiting for the water to boil, put the olive oil in a small saucepan over low heat. 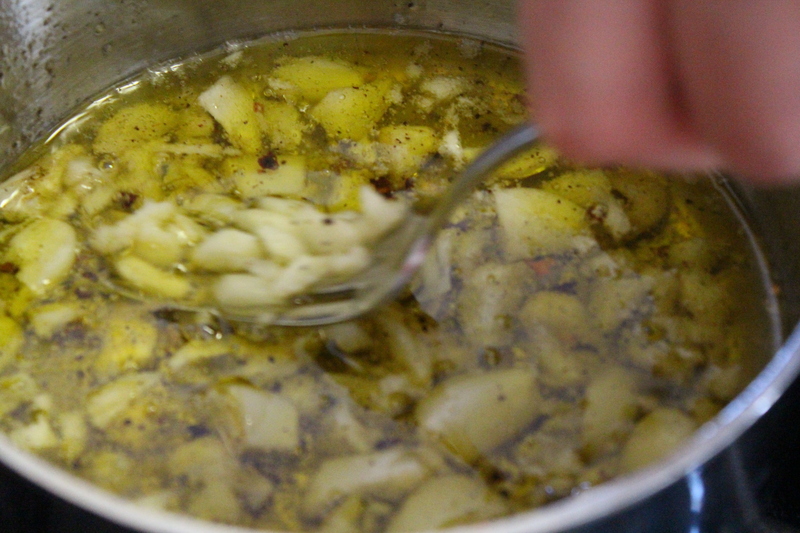 Peel and cut the ends off of the garlic and put into the warming oil. Add the dried pepper flakes and black pepper. Swirl the saucepan occasionally to stir. Cut off the ends of the pepperoncini and coarsely chop. Set aside. NOTE: If you have some who like and some who don’t like the heat, chop more pepperoncini to pass at the table. When garlic has softened, about 10 minutes, use the tines of a fork to mash the cloves into chunks. 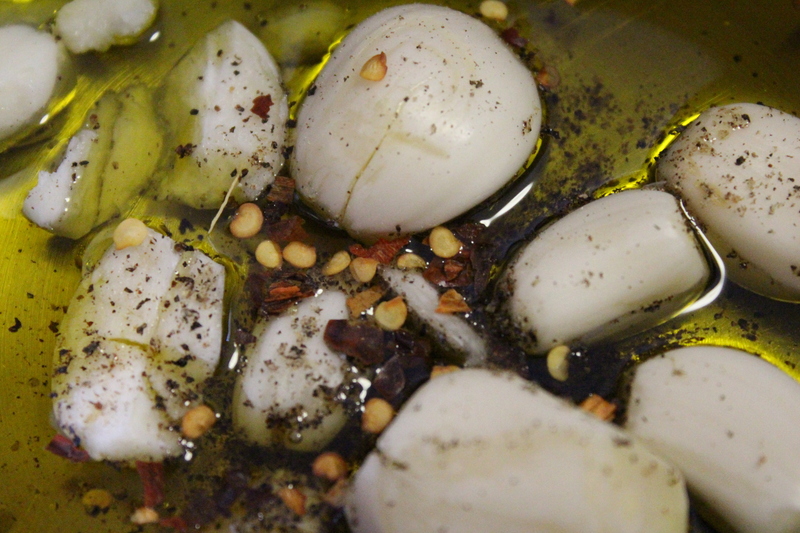 Keep the garlic in identifiable bits; you don’t want a paste. When the pasta has finished cooking, drain and put back into the pot off the heat. Pour the oil, peppers, and garlic into the pasta and toss. Add the chopped pepperoncini and toss. Put into a serving bowl and top with a generous shower of the grated cheese. Save a small bowlful of cheese to pass at the table. NOTE: The irritating use of “or more to taste” will make sense if the first time you make it you think, “whoa! this is too hot!” or vice versa. It’s really a taste preference thing. The recipe above is pretty mild on a heat scale. This entry was posted in Main Dish, Pantry Friendly, Pasta and tagged budget friendly, Cheese, comfort food, Easter, family dinner, Italian, Lent, Lenten meal, Nonnie, Pantry Friendly, pantry meal, pasta, pepper, pepperoncini, quick, quick meal, tradition, vegetarian, weeknight meal. Bookmark the permalink.